NAPA, Calif. (CNS) — It is in the appearance of Our Lady of Guadalupe in 1531 to a poor Indian convert that we can see God’s plan and care for America today, Los Angeles Archbishop Jose H. Gomez said in a July 27 address that tackled the “de-Christianization” of U.S. culture. “At Guadalupe, the mother of God came to be the mother of the Americas,” Archbishop Gomez said on the opening day of the Napa Institute Conference. “We need to consecrate our Christian lives and the church’s mission to the Virgin,” Archbishop Gomez said. “I think this is the answer to the challenges we face right now in our culture. The way forward for our church — right now, in this moment — is to ‘return’ to Guadalupe. 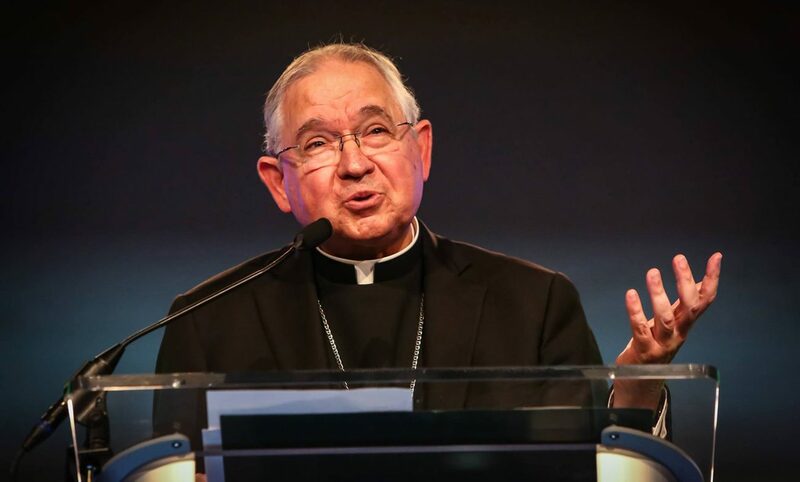 “We need to follow the path that the Virgin sets before us — the path of building a new civilization of love and truth in the Americas,” Archbishop Gomez told the approximately 500 people gathered for the four-day conference in Northern California’s wine country. Our Lady of Guadalupe was given to us by the Lord, and she was given to us in all times, not just the times of St. Juan Diego, the peasant to whom she appeared and on whose “tilma,” or cloak, the winter roses she caused to bloom left her image, said Archbishop Gomez. “What Our Lady said to St. Juan Diego, she now says to us: ‘You are my ambassador, most worthy of my trust,'” Archbishop Gomez said. Archbishop Gomez said American culture has become an alien landscape for Christians. “In the last decade, it is like we all woke up to discover that American society is being progressively ‘de-Christianized,'” Archbishop Gomez said. And that is changing, he said. “We face an aggressive, organized agenda by elite groups who want to eliminate the influence of Christianity from our society,” Archbishop Gomez said. “My friends, we do not have the luxury to choose the times we live in. These are hard times. There is no denying it. But the saints remind us that all times in the church are dangerous times,” the Los Angeles archbishop said. Within a few years after Mary’s appearance, millions were baptized in Mexico and throughout the Americas. “A great wave of holiness swept through the continents — raising up saints and heroes of the faith in every country,” Archbishop Gomez said, noting St. Junipero Serra set sail for the New World aboard a ship called Nuestra Senora de Guadalupe. He arrived at Veracruz and he immediately started walking — 300 miles to the shrine of Our Lady of Guadalupe in Mexico City, where he spent the night in prayer and consecrated his American mission to Mary. “Guadalupe is the true ‘founding event’ in American history. And that means it is the true founding event in the history of our country — and in the history of all the other countries in North and South America. We are all children of Guadalupe,” Archbishop Gomez said. “The great St. Pope John Paul II called the image of Our Lady of Guadalupe — ‘the Marian heart of America,'” Archbishop Gomez said. Our Lady of Guadalupe – Pray for us.